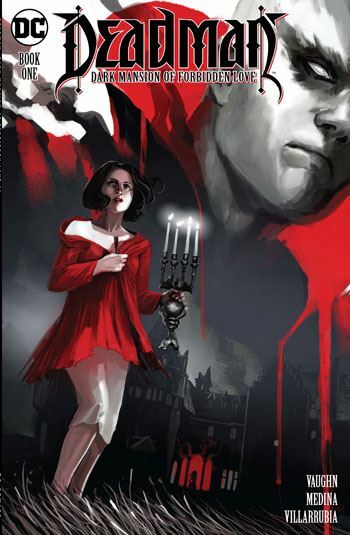 The new Deadman miniseries is subtitled Dark Mansion of Forbidden Love, which was the name of a short lived Gothic romance/horror series that DC released in the early 70s. It’s an appropriate name for this story, which evokes many of the elements of a classic Gothic romance. You have the big spooky house, a brewing romantic triangle, and, of course, a ghost. More than one ghost, actually. Deadman is drawn to the house, and believes that he can be of some aid to the ghost trapped there, or to the man woman in the story, Berenice. Things don’t quite work out that way. Berenice has always been able to see ghosts, and so can converse with Deadman. That’s a big plus, narrative-wise. And it adds another element, after Deadman possesses her body. Berenice reacts as though Deadman has personally violated her, and he is surprised by her reaction. This has been dealt with before, in Kelly Jones’ Deadman tales from the 90s. But it still makes for some good conflict between the two lead characters. Berenice’s boyfriend Nathan has inherited the house, and though we are told they are in a relationship, Nathan seems far more interested in exploring the house than in exploring Berenice. As for Berenice, we discover she has a lesbian past (which Nathan probably doesn’t know about), and is having conflicted feelings about her trans friend, Sam. Of course, this story is about more than the romantic tribulations of the characters. There are clearly some dark secrets in the house, more than one spirit haunting it, and something evil that is trapping Deadman inside it. The art is beautifully rendered, both on the people and on the location. The house in a well done gothic is essentially a character unto itself, and Lan Medina imbues the edifice with life and menace.